Welcome to OneLotto! The next platform in our lottery online review series. If you are looking for a platform with a big offer of lotteries, you found it. OneLotto.com site design is great, including images, slides and an easy navigation bar. Furthermore, the user experience it is very well developed. The One Lotto site offers the major lotteries from Europe, Australia and USA with the major prizes you will find in any other game. Languages are limited, as well as banking methods. Still, you will find the most popular ones at the site. Read all our review in order to acquire all the knowledge you need before start your online lottery path! Security measures provided by the brand and gaming authorities licenses. Variety of lotteries, games and gaming modes. Technical and design development of the site. User experience quality. We check desktop and mobile devices functionality and response. What are the offers for existing and new users. We review customer support department response time and quality of service. The OneLotto.com site transactions and data are SSL 128 bit secure by GeoTrust. This is not the higher level of encryption security, but still will widely keep you secure and safe. 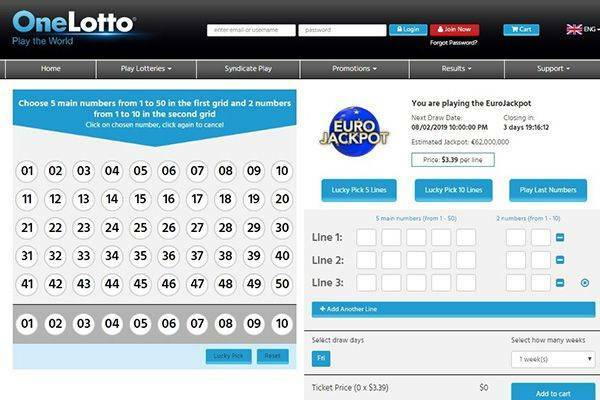 In addition, the One Lotto brand is regulated and authorized by the Curacao Government. Therefore, all your activities and the brand behavior are under legal scrutiny. Playing lotteries at OneLotto is very simple, you just need to choose your favorite raffle, pick your numbers and proceed to the cashier. The most difficult issue can be, with the big offer at OneLotto, in choosing which lottery to participate in. 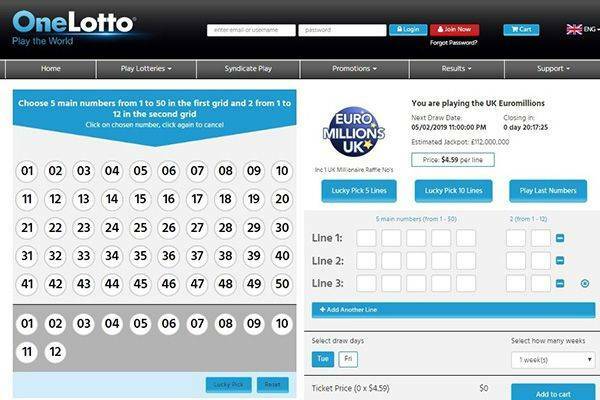 The selection of lotteries available at the site include: SuperEnalotto, Spain BonoLoto, Irish Daily Million, EuroMillions, US MegaMillions, Greek Lotto, French Lotto, German Lotto 6aus49, Mega Sena, Irish Lotto, UK Thunderball, US California SuperLotto Plus, US PowerBall, Australia PowerBall, Greek Joker, Spain La Primitiva, EuroJackpot, El Gordo from Spain and OZ Lotto. Regarding the syndicate mode, where you can buy with a group of people several tickets, the offer lotteries are: SuperEnaLotto, EuroMillions, US MegaMillions, US PowerBall and EuroJackpot. You will not find any side game, as scratch cards or keno, that are many times offered in another platforms. 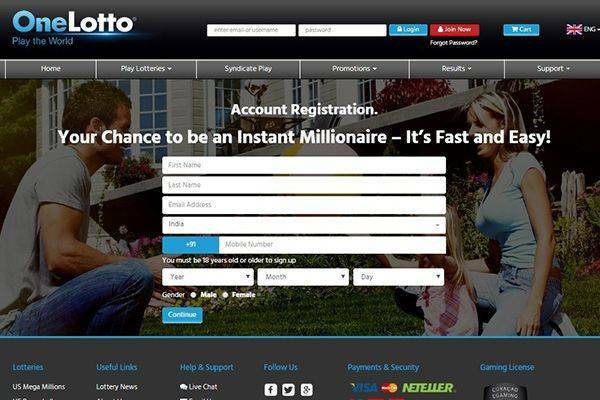 OneLotto.com is strictly a lotto site. The Onelotto.com available languages are very limited. Actually the site is provided only in: English, Chinese and Thai. In consequence players will need to use the English version of the site. As we mentioned at the products section, you will be able to play with the syndicate mode. Onelotto.com site is fully responsive. This means that you will get the site with its fully functions with your desktop, tablet or smartphone. The mobile devices template is still very clear and easy to use. One of the problems of mobile sites view is that the small size of the screen tends to reduce the user experience. In this case, the development team solved the issue perfectly. Tablets are currently sharing the smartphone views. Anyway, the experience is superb. Excellent user experience and design. Sliders and navigation bar really useful for players. Tablets are currently sharing the mobile template. Still very nice execution of all the features. The site template is responsive to every screen size. You will get a great mobile site with the same options you will get as in the desktop version. One of the strongest points, besides the big number of lotteries available, is the promotions and offers of OneLotto. For new players, you can get a first deposit bonus of 100% up to £50 for the largest lotteries as US PowerBall, US Mega Millions and more. This is a great way to start playing at a lottery platform. For all players there is a set of discount for future draws. If the draw is in another 4 weeks you will get a 2.5% discount, 8 weeks 5% discount, 26 weeks 7.5% and finally for 56 weeks advance you will get a 10% discount on the ticket value. Finally, OneLotto offers a daily deal, the last deal of the day we checked at the site is an promotion of getting 1 line free when buying 10 lines. Customer support is a key department of any brand. Reviewing the quality of this service will give a very important view of the site. Live Chat is available at the site. Obviously, it will be best to use this function on your desktop computer. You can call OneLotto customer service department to the landline: +44 121 396 1171. The phone channel is available 24/7. Contact the support team at Facebook, Twitter or Google+. This is a very fast channel to get answers to any inquire. 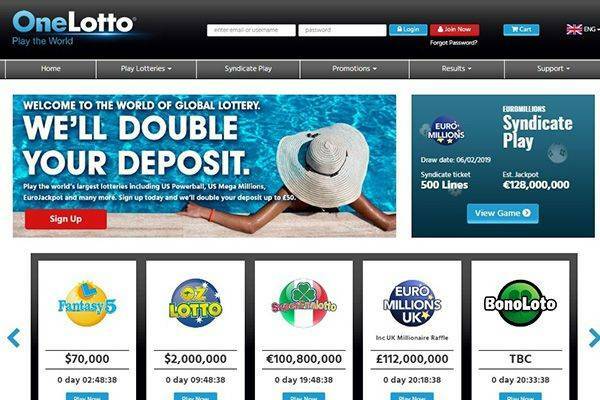 OneLotto.com is a strong competitor in the online lottery tickets purchase world. Great promotions and wide variety of lotteries to play with are the main offers of the brand. The opposite is true for the payment options available. Only Visa, MasterCard and Neteller are the only ones accepted by the brand. We strongly recommend that OneLotto needs to improve this. The great responsive template will easy your first steps knowing the platform. Additionally, the syndicate lotteries are very ordered in an easy to read table. We gave them a great 4 over 5 points in our reviews list! Visit OneLotto.com and start the path to become rich playing online lotteries! The last topic of our review will answer a very important question: is One Lotto a scam? or is a legit platform? The gambling licensed provided by the Curacao authorities is a strong signal that we can trust the brand. Furthermore, the 128bit SSL encryption of all transactions will provide complete security and safety. 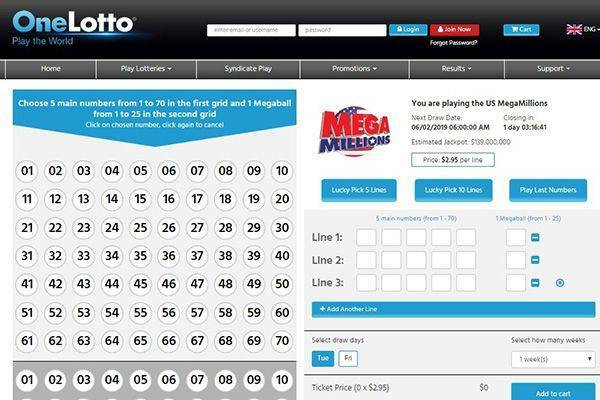 Finally, we recommend you to buy lottery tickets at OneLotto.com! Is a legit player in compliance with strict regulations and norms. Just relax and enjoy.